Program Description: The library, in collaboration with the Leisler Institute for the Study of Early New York History and the Gotham Center for New York City History, presents How Their Poor Wives Do: The Role of Women in Late Seventeenth-century New York Politics by David Voorhees. 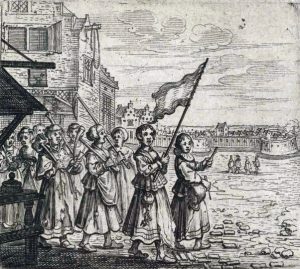 Widespread female violence against men is found in the records of the 1689 New York uprising popularly known as “Leisler’s Rebellion.” This talk by the director of the Leisler Institute explores this outburst of activism among New York women a generation after the English takeover of New Netherland. Dr. Voorhees is director of the Jacob Leisler Papers Project, formerly located at New York University, as well as the Jacob Leisler Institute headquartered in Hudson. He’s also managing editor of de Halve Maen (The Half Moon), a quarterly scholarly journal published by The Holland Society of New York. An NYU research scientist, he is former managing reference history editor at Charles Scribner’s Sons and has published numerous historical works and articles, and been a consultant on historical exhibits at the Museum of the City of New York and the Bard Graduate Center in Manhattan among others. A question and answer period and refreshments will follow the talk. For more information email programs@hudsonarealibrary.org, call 518-828-1792 x101, or visit the main desk in the library. The Jacob Leisler Institute for the Study of Early New York History is an independent, not-for-profit study and research center devoted to collecting, preserving, and disseminating information relating to colonial New York under English rule. In the years spanning 1664 to 1773, New York province’s diverse European settlements and Native American and African populations fused into a cosmopolitan colonial territory with ties throughout the Atlantic World. The Institute is unique in focusing on this under examined 109-year period in American history. This entry was posted in Adults, History Room, News, Programs and tagged 17th century American history, Feminists, Leisler Institute, Leisler Rebellion by Brenda Shufelt. Bookmark the permalink.